performed to treat traumatic malocclusions. What is the difference between root canal therapy and vital pulpotomy? Vital pulpotomy is also called "partial coronal pulpectomy" whereas root canal therapy is complete pulpectomy. If the entire pulp is removed, the tooth is dead and will not develop further. Root canal therapy is performed on vital, dying and non-vital teeth. Vital pulpotomy is used only for vital or live teeth, therefore dental radiographs are always required to help determine that the teeth are living. Vital pulpotomy is not appropriate for discolored teeth with pulpitis. Vital pulpotomy can be performed on teeth where root canal therapy is not advised. Very young teeth cannot be treated by root canal therapy because the root apex (end) has not formed. Once root canal therapy is performed, the tooth is non-vital (dead) and will not continue to develop. Vital pulpotomy can be performed on young teeth regardless of whether the apex (root end) has closed and the crown and root walls are inmature (thin and weak). Root canal therapy for weak teeth is not advised. These teeth will fail to develop after root canal therapy; they remain fragile and easily fracture. Treatment with vital pulpotomy is preferred because the tooth remains vital and continues to develop and strengthen. Vital pulpotomy is most appropriate for young, inmature teeth. 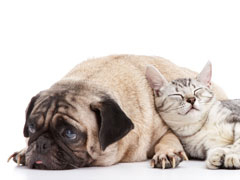 Root canal therapy is more appropriate for animals over eighteen months of age. (thin walls and early root end closure). Dog; 7 month with traumatic malocclusion. Crowns were reduced and capped. to the level of the incisors. Initial radiograph before vital pulpotomy. the pulp was exposed and bleeding. strength as the tooth develops. Vital pulpotomy is also a beneficial procedure for continually erupting teeth in rabbits, chinchillas, guinea pigs and other rodents that have been fractured and have pulp exposure. These animals must have teeth to survive. Fractured teeth with pulp exposure can become infected and die. Dead teeth no longer erupt. The result is severe life threatening malocclusion development.